TapTap bracelets are a new Russian product that people are raising money for on KickStart. The team of developers from Izhevsk has already raised $17,000 and has another $113,000 to go. TapTap bracelets transfer information from one bracelet to another, designed for couples who want to be reminded of the object of their affection even when that person is far away. The bracelet consists of an impact-resistant plastic module and hypoallergenic silicone strap; it has one button that sends signals and turns the device on and off. It also features a micro USB for charging. Charging the device takes about an hour, and then the gadget can be used for a week. TapTap will be sold with its app, which is used for configuring the bracelet and allows you see your partner "touch" the screen of your smartphone — a startling yet impressive experience. Developers did not restrict the intended users of the device to couples only. 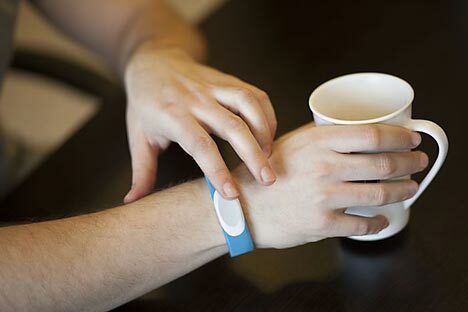 The bracelets have a built-in accelerometer, gyroscope and other features. For example, certain features allow the bracelet to be used as a smart alarm, an activity sensor, or a game controller. Purchase of two bracelets costs $90, plus shipping. Despite the fact that some observers are eyeing the project with skepticism, the developers have had some noteworthy, successful ventures in the past: These are the same people that raised half a million dollars on Crowdfunding in April for Lightpack, a lighting control for monitors and televisions.